Um... ok... 19 months. I started this post a whole month ago... and there it sat as a draft. Ana is 18 19 months old. 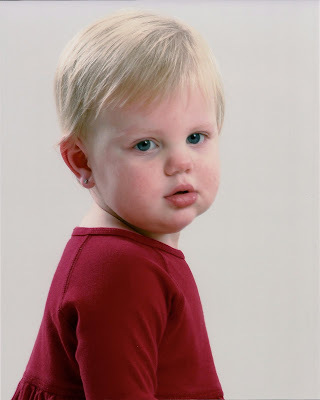 (Although these are her 18 month portraits.) Talk about time flying by. 18 month old Ana does NOT like to have her portraits taken. 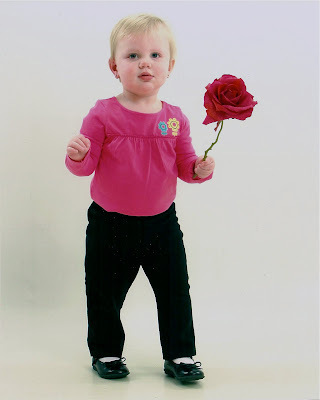 It took a lot of tissues wiping tears and snot to get these shots. They were mostly taken in between tears and Ana trying to run far away from the backdrop. But... we got some shots. (The scanning is awful. The quality is honestly much better in person.) I swear she was looking at me and asking "Why are you torturing me this way? Why is this strange lady clicking her camera at me? Don't you do that enough at home already????? Hopefully we'll get some smiley pictures next time. Ana continues to steadily grow. She is easily off the charts with both height and weight... and the nurses write ">97th percentile" in her little book. Greater than 97th percentile! What percentile that really means I don't know. 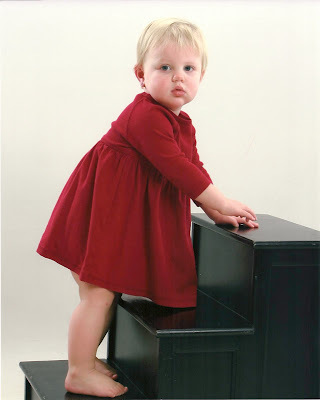 At her 18 month appointment she weighed in at 31 pounds and 14 ounces. 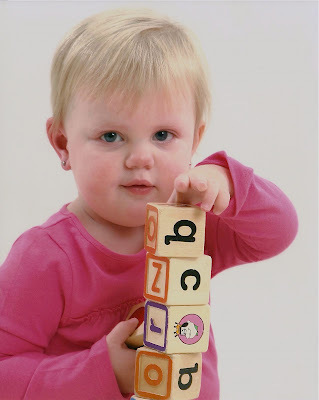 (Zoe was 31lb 12oz at her 3 year old appointment!!!) Ana's height measured 34 1/2 inches. (Zoe was 35in at her 2 year old appointment!) She is a big 18 month old. She's more the size of a 2 1/2 year old. It's fabulous that she's healthy and growing (and the doctor's office has no concerns). But... I gotta say... my back in killing me. It's not easy carrying her around. I think I make her walk a lot more than I made Zoe walk. Ana is a chatter-box. She doesn't just say single words here and there. She doesn't even just say 2 word or 3 word sentences. It's crazy how well she is talking. She's funny sometimes though. I'll ask her "Ana, do you want grapes?" and she'll answer "NO, I want gapes.". Each answer has to start with NO now. She's definitely talking like a 2 year old. That's a BIT exaggerated. She didn't stack every single block. I did the first 2. Ana stacked the next 4 or 5. When they fell she said "Uh oh... sorry." Is that something18 month old do? Ana LOVES The Wiggles. They are her current obsession. I can get a free moment here and there because of Ana's best friend "An-fo-ny". (She likes them all but she LOVES Anthony!) She will walk around with the DVD box yelling "I like Wiggles! I like Wiggles!" which means... "PUT IN THIS DVD RIGHT NOW!" As active and talkative as Ana is... she is also calm and quiet. She can stay alone happily for long periods of time. This is especially true in her crib. I am very lucky in this respect. Ana will happily go to bed. She will wake up happily. She naps easily. Always. ALWAYS. It's really crazy. I hate to even talk about it for fear of breaking our 18 (19) month run. Don't misunderstand. She doesn't necessarily sleep the whole time she's in her crib. Some days she will say in her crib for a 2 hour "nap" but not sleep a wink as far as I can tell. She chats, sings, plays with her stuff animals, turns on and off her crib music aquarium. She does that in the mornings too. She is an early (sometime obscenely early) riser. BUT... she never cries. She never yells to get out. She just makes herself busy. Half the time when we go in to get her she doesn't even want to get out. If we're not in a hurry to get somewhere I'll just sit in the chair in her room while she chats with me. Zoe has even started climbing into the crib to hang out with Ana some mornings. (I will admit that I have felt almost decadent some mornings sending Zoe in with Ana and staying in bed for an extra half our or some. bad bad mommy.) I hope she always loves to sleep and hang out in her bed this way. But... when the inevitable happens... and she switches to a toddler bed... and can escape her room to come get me... I'm sure I'll be getting up by 6am or earlier. I dread that time and I'm sure I'll be popping back to this post to remind myself of a better rested time. -Oh, nice (as she puts her cheek to her shoulder like she's snuggling something). -When we ask Ana "What's your name?" She will answer "BECCA!" or something that sounds like "A-becca" or "I Becca." She just refuses to say Ana. She has a little friend Rebecca and insists that her name is Rebecca too. Crazy girl. It took me forever to start and complete this post. Now, of course, that I got into the writing and thinking about Ana and all of her little personality quirks I think I could write a book. She is so much her own little person. She constantly keeps me guessing. On my toes. Wondering what she will do or figure out next. I have to work hard with her. She needs more attention sometimes... but little attention other times. She wants to be on her own... but she wants to be in the middle of it all. She wants to know everyone, and talk to everyone, and play with everyone. This is all such a slight glimpse of her huge personality. She is a little tornado running through our house. She is a little tornado that has just spinning it's way all around my heart. What a whirlwind it is being her mommy.